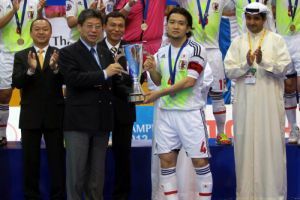 Dubai: AFC Acting President Zhang Jilong congratulated Japan after being crowned the new kings of Asian futsal following their sweeping 6-1 victory over Thailand in the AFC Futsal Championship UAE 2012 final. “Firstly, I would like to congratulate Japan for regaining the title they last won in 2006," he said. “Iran and Japan have been a dominant force in Asian futsal over the years but teams like Thailand, Kuwait and Australia have proved that they are capable of turning the tables.